A man was shot and killed in a drive-by shooting in the Hyde Park area of South Los Angeles and authorities searched Tuesday for the shooter. 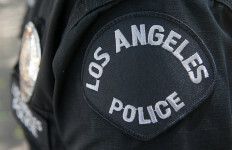 Police responded about 11 p.m. Monday to the scene near 62nd Street and Van Ness Avenue and located the victim, according to Officer Mike Lopez of the Los Angeles Police Department’s Media Relations Section. The suspect drove up and shot the victim, Lopez said. NBC4 reported the victim was riding a bike and was found lying in the middle of 62nd Street when officers arrived. A detailed description of the shooter or the vehicle was not immediately available, Lopez said. The shooting was gang-related, he said.